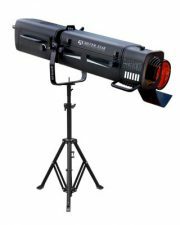 TRACER is a follow spot, with 250W highly efficient LED module. Its ergonomic design allows for easy operator control of all the follow spot features. The TRACER has a zoom range 10-20° and is ideally suited for small to medium size theatres, auditoriums, churches, banquet halls and rental house applications.